If you struggle with meeting deadlines, fulfilling commitments, and completing projects on time, then this book is for you. By now, everyone is well acquainted with the benefits of being productive and good time management; the problem is how to go about it. In our fast-paced world of today, it has even become more important than ever, but the abundance of trivial, misleading, and sometimes even harmful information is a cause for concern. In this insightful book, Chris Allen cuts through all the noise and feel-good platitudes rife in this topic and shows you how to become productive and really effective at managing your most limited resource - time. 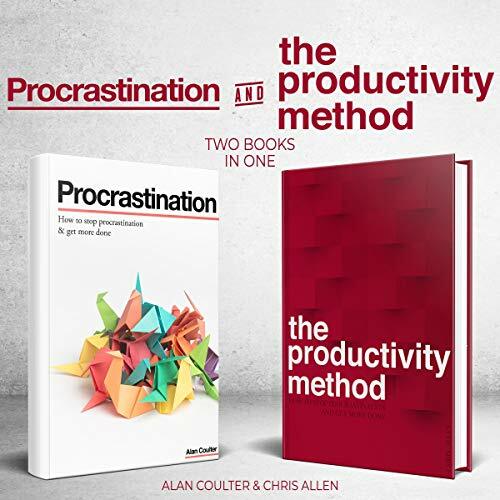 With numerous examples and case studies, Allen clearly outlines the steps that many others took to achieve peak productivity and eliminate procrastination shows you how you can replicate their success for yourself. Concise, practical, and chock-full of actionable advice, The Productivity Method is a book that will imbue you with a fresh perspective on productivity and equip you with the tools needed to become a top performer wherever you find yourself. Procrastination can cost you opportunities to change your life for the better. Scroll up and buy now and become more efficient today! I already had the Productivity book (which I loved), but to get this AND the procrastination book in the same package was too tempting to resist. 3 weeks later - getting more done. Feel more calm. Feel more together. Delaying less. Messing up less. 10/10! I have no hesitation in giving this a five star review simply because of how much I gained from both books. Working out HOW to actually be more productive and more of a "do-er" sort of person is not easy, but these two books perfectly distill all the info out there and provide you with a quite awesome framework for life in general. An inspiring, enjoyable and informative listen. Could not believe it when I saw both of these books together for that price. Content, narration and production is top notch. If you would like to get more done in life in a calm, confident, mature way then I highly recommend this book bundle. I have listened to it 3 times now and I am still picking up stuff.